winter weather- are you prepared? After a winter like 2013/2014, we’d hope that everyone would be prepared for cold weather. Just in case you’ve blocked last year’s freezing temperatures from your memory, here are some reminders to keep everyone on your farm warm, healthy and safe this winter. 1. Get your flu shot! Think December is too late to get vaccinated against the flu? Think again, and encourage your employees to get vaccinated too. You might consider setting up a flu shot clinic at your farm to make it more convenient. 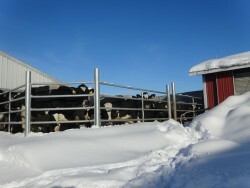 The more people on your farm that are vaccinated, the healthier and more productive your work force will be this winter. 2. Dress appropriately for the weather. Insulated, waterproof boots and wool socks are a must. Dressing in layers and wearing sweat-wicking clothes, a hat and gloves will keep you warm no matter your activity level. 3. Know the signs of frostbite. Last year was the first year in recent memory that many people really had to worry about frostbite in Western NY. The first signs are cold skin and a prickling feeling, then numbness and red or pale skin. This is frostnip, which won’t permanently damage skin. Give yourself a review on signs of the later and more dangerous levels of frostbite by looking up “signs of frostbite” at http://www.mayoclinic.org. 4. Look out for your Hispanic employees. Last year was a shock to many who were born and raised in NY, so imagine what it was like for someone experiencing their first NY winter. Consider the fact that those used to warmer climates may not know strategies for layering clothing or recognizing frostbite. Taking them on an extra shopping trip to purchase warmer clothes or giving them a bit of advice can make for warmer, happier and more productive employees when the mercury heads south. 5. Stay hydrated. When it’s cold, many people tend to drink less; yet active farm employees still sweat and lose electrolytes during normal farm activity. Encourage employees to drink more by making hot and cold water readily available. 6. Take proper care of machinery. Make sure to train employees which tractors need to be plugged in at night to avoid problems starting in the morning- this is again something that new Hispanic employees have probably never done before. 7. Pay extra attention to newborn calves: dry them off, provide plenty of bedding (straw is best to allow for nesting) and feed them one gallon of warm colostrum within the first hour after birth. 8. Take care not to rush cows when moving them. Cows walk comfortably at 2 mph, while humans tend to walk at speeds of 4-5 mph. When cows are pushed to walk too fast, they are more prone to slip and fall. This is exacerbated by slippery conditions caused by snow and ice. Use a material like calcite to improve footing in areas prone to icing. Wishing you all a safe and productive winter!